Hey look, that incredibly popular occasional series 'Cooking with Bruce' is back. Brilliant! i've decided to explore marinades a bit over the coming weeks, so this will act as a record of what I play with. This has been driven by a strange stirring for the sauce/marinade used on pork ribs, which is odd, as I hate pork ribs. So the following will be using vege's, but can be applied to meat, since that's where I'm ripping the ideas from. Oh and in a gadget update, I've got a blender. For me, this counts as a massive gadget update, since my kitchen is oddly gadget free. Blend all these. Roughly chop your veges, I used capsicums, carrots, quorn, chillis - so pretty much what was left in the house. Combine marinade and veges. Bake at 200C for 45mins. Mix slaw, toss dressing through slaw. Serve the veges/marinade on rice and shake some sesame seeds over it. Slaw on the side baby. We realised some time had passed since our last (group) whisky imbibing, mainly as we are really bad at getting organised. But we made it happen, we made it real. The first whisky released from the newly restored Glenglassaugh distillery. Alec and I have followed them at Whisky Shows, and become quite addicted. Ok, very addicted. They did bottle their first cask, but that was going for around £100, so we said no to that. But picked up the Revival, a snip at £35. We liked this a lot, it's a very nicely balanced whisky, you'd guess speyside, but you wouldnt guess how young it was. Basically, it all bodes very very well for them. 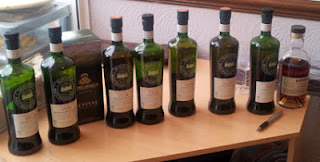 And back to our usual SMWS bottles, this one from the Ardmore distillery. We liked this, but it didn't thrill us, and wasn't as good as the Revival. This from Linkwood. Who I've got a softspot for. This one split the tasting panel, admittedly we're known for disagreement, and discussions on the finer points of grading do last for hours. But as this was only whisky number 3, we weren't too split. Look at us, vertical tasting on Linkwoods! This one was a lucky dip by the tin-arse cabal member, he who keeps getting brilliant whiskies by random selections. I threw this in to scare the crap out of the cabal. Nose: sherry, fudge, oloroso sherry, "manly dram"
"The Nigel Tufnel : for when you need a little bit more"
"I've had weaker sledgehammers to the face"
Basically, £37 of extreme sherry. From that little known distillery, Glenmorangie. But we agreed it's the best Glenmorangie we'd had. None of us are fans, it's too light, too emasculated. This at least demonstrated they can make interesting whisky, even if it's then suppressed and mixed to boringness for retail. This from the Glenburgie/Glencraig (closed) distillery. Not liked by the panel. Our notes describe it as stunning on the nose, and vicious on the palate. A marmite whisky. There we have it. We all survived.